From the July 2016 digest, you can see how diligently the small number of WBA committee member's work. This volunteering protects your future riding on bridleways and byways in the county. This is the current WiP (Work In Progress) I have grouped them so they are NOT in order of receipt but in type of issue we get to consider, investigate and hopefully resolve with the help of the local riders, landowners and ROW team at Wiltshire Council. Milton Lilbourne BR18A & Pewsey BR 33 – our area representative has had positive responses from the WC RoW Warden, Paul Millard, using a company from Swindon, two new BR gates and a Kit Bridge are to be installed very soon. 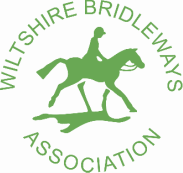 The chairman represented Wiltshire Bridleways Association at the July Wiltshire RoW Group and CAF (Countryside Access Forum) meeting. Points of note for us were proposed diversion of a bridleway Everleigh 15A (currently ploughed & seeded) on MOD land. We have already been involved in this planning application and support the proposal fully which provides an appropriate bridleway standard and length. And the definitive line of the notorious Gypsy Lane route which has been an ongoing campaign for us for many years. The meeting also tabled the Delivery of National Trail Standards and World Heritage Sites. Relevant to Wiltshire riders of the Ridgeway National Trail at Avebury. Maintaining routes on these historic sites is often even more challenging, protecting the underlying archaeological structures being important. CAF champion continued funding for RoW in the county however DEFRA funding for National Trails remains the same as last year but came with no guarantee that it will be available in future years. So it is even more VITAL that our small Wiltshire Bridleway Association keeps strong and develops with a larger membership to ensure we have funds for our own causes. We get included in all planning applications to do with rights of ways be they BR or FP or BY. We need to be aware of any changes to existing routes that developments make so we can protect them. Stonehenge A303 area, being considered again for underpass and rep contacted by Open Spaces Society for involvement. Area Rep keeping in the loop to planning stage – requests assistance hereafter. Calne Without FP34, Moggs Lane, a legal event order making this a BR never took place, WiP for Area Rep.
Keevil 23 – should be a Rest. BY need to check historical data on WBA file. It is really quite hard to see what the Wiltshire Bridleway Association commitee members do for riders in Wiltshire unless you attend a meeting, get involved with a bridleway petition or read the meeting minutes so here is a quick snap shot of the recent meeting minutes new matters arising for you! May be you will see an item that you reported in or know about?! A WBA Member from near Urchfont has sent in details about her recent report of an obstructed bridleway and subsequent action by Wiltshire CC supported by WBA. During the late summer of 2015 I ventured out to find a new bridleway. Here is what I reported to Wilts CC via their online reporting page. "I went to ride MARD6 from the Byway along the ridge CHIR10 down towards the A342. The gate at the top won't open and a pile of rubble and large log blocks the access. I managed to get past the 1st obstruction but found no route through MARD6 down the steep hill between the wooded parts as illustrated on the maps. I rode to the right at the copse top, as indicated on all maps but came to a wire boundary fence and couldn’t see the way through or down. The route to the left is marked 'Keep Out' by the game keeper. So this bridleway is obstructed twice." With some sweet talking we made a stop start yet steady descent and got to the bottom safely, transversing as we went and there was just enough room to get past the wiltshire gate at the botom and onto the easy going of MARD6. I will pursue this with WCC and the landowner however as it's quite a challenge!"